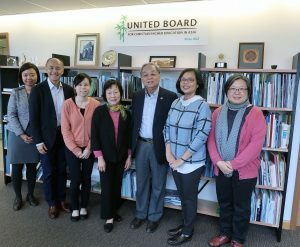 David Pong (third from right), his wife, Barbara (center), and daughter, Myra (third from left) visit the United Board’s Hong Kong office. David Pong, professor emeritus of history at the University of Delaware, had been giving to the United Board for years before he realized the role it played in his own family’s history. In 1947, his father, Rev. 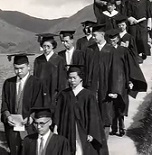 James Tak-Ming Pong, was a professor at Lingnan University in Guangzhou when he learned he had been awarded a scholarship from the Associated Board for Christian Colleges in China (later renamed the United Board for Christian Higher Education in Asia). That scholarship enabled his father to earn a master’s degree in government from the University of Chicago. 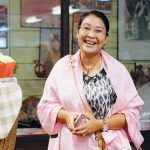 It stood him in good stead later as he pursued theological studies at St. Augustine’s College, Canterbury and Oxford University, held academic leadership positions in Hong Kong and Taiwan, and served as the Episcopal Bishop of Taiwan in the 1970s. 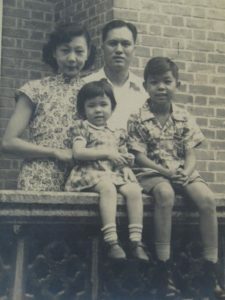 David Pong as a young boy in Guangzhou with his parents and younger sister. The photo was taken after his father returned from the University of Chicago. The United Board appreciates Dr. Pong’s leadership and service in support of whole person education and is grateful for the contributions he and his sister Rachel provide to the Faculty Scholarship Program.